After Christmas-ing all weekend with family, I decided that Monday morning was the perfect time for a run, despite the stupid temperatures outside. As a Gone For A Run Ambassador, I occasionally receive opportunities to participate in their virtual races free of charge. The Catch Me If You Can Virtual 5K was no exception! Thank you, Gone For A Run! I was excited to run this 5K for a couple of reasons - #1, Santa brought a new Garmin to me for Christmas and #2, I had the chance to try out my new RokBAND in a different way (besides covering my face and nose at the Santa Hustle so it wouldn't freeze and fall off). This 5K was completed around my normal at-home route. I also started coming down with yet another sinus issue on Monday, so I took this run slow and easy because I was having trouble breathing. I am in love with the features on my new Garmin!! Afterward, I had Jason take a picture of my sweaty self with my medal in front of the tree! I LOVED the RokBAND and definitely want more in different colors! The "ugly sweater" pattern was perfect for Christmas and paired nicely with my Gone For A Run Christmas shirt (purchased by yours truly for the Santa Hustle). The medal for this race was adorable, too! I haven't tried the cookie/ornament press on the back but it's definitely something I would like to do! Overall, this race was a fun one and I loved participating! For $20, runners received a bib and medal. Add-ons such as the RokBAND were an additional fee. Thanks, Gone For A Run! Did you run any races over the Christmas holiday weekend? 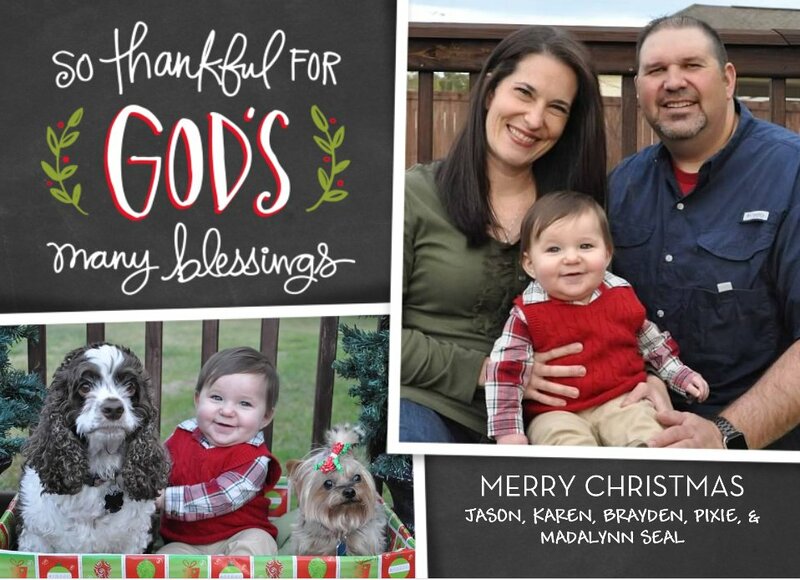 Well, Brayden's first Christmas has officially come and gone. We had a wonderful weekend celebrating with our families and I wouldn't have asked for it any other way! 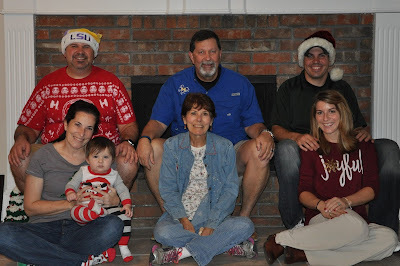 On Friday night, we began by visiting with Jason's dad, exchanging gifts, and having dinner. Brayden was as tall as his gift bag! Bonus: he loved playing with his gift, too! Sadly, I told her she had to wait just a few more days! Christmas Eve was nice and laid back. I decided not to run that morning but instead to sleep in. I definitely needed to catch up on my sleep and that was the perfect time to do so! It's amazing how much you prioritize sleep once you have a baby...you never know when they are going to wake up (sometimes in the middle of the night and sometimes not)...it's just so unpredictable! 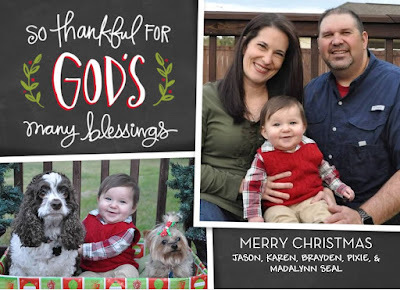 Our church hosted a Christmas Eve service this year instead of a service on Christmas morning. My husband played in the orchestra, so Brayden and I got there early with him for rehearsal. While Jason was rehearsing, I hung out in the coffee shop. The coffee shop was officially closed, but cookies and coffee/hot chocolate were available at no charge. After a few minutes, it was apparent that they were desperately in need of help. The "self serve" station idea was not working...like at all. Thankfully, my parents walked in the door at that moment, so I was able to give Brayden to them, then run over to help out in the coffee shop. Ever since having Brayden, I only help out in the coffee shop on special occasions or when they need me. It was nice to be back there helping once again! Our Christmas Eve service was a beautiful one filled mostly with music and a short message from our pastor. We finished off by singing Silent Night to candle light. I loved it and Brayden did well in service up until about the last 10 minutes or so when he became restless. For dinner that night, we had my parents and Jason's parents over for chili. 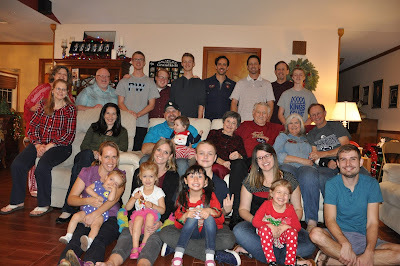 It was delicious and we had a great time with them on Christmas Eve! I love our Christmas countdown! It was so much fun to watch as the day drew closer and closer! I was super pumped for Christmas morning and Brayden's first Christmas! The doggies FINALLY got to open their gifts...and boy did they tear into them! They crack me up! Most of Brayden's gifts consisted of toys that lit up and made music! He loved them! Our main gift to him was a Mickey Mouse walker...which he also loves! On Christmas Eve, our brand new AC unit decided to act up. Yes, we had the AC on during Christmas weekend. Thankfully, it still blew enough cool air to keep the house somewhat bearable. My dad's oven also went out on Christmas Eve. SO, Christmas dinner ended up being at my house! I was excited that I had the opportunity to use my Christmas dishes three times in one weekend! After dinner, we went back to my dad's house for gifts between my parents, my brother and his wife, and us. My sister in law captured my most favorite picture from our Christmas weekend! Love love love it! Again, the weather was warm and humid, so I was in shorts. This weather is crazy, y'all. Freezing the past two weekends and hot on Christmas. Sheesh. Brayden (of course) decided he would attempt to open a few gifts on his own. Now that he knew what to do with them, he wanted to open them all! Breakfast consisted of a few leftover goodies which were yummy, of course! That night, we celebrated Christmas with Jason's family...the whole giant lot of them! Needless to say, we had a lot of fun on Monday night! Brayden loved playing his new xylophone with his great-grandmother, too! I just love precious memories like these! 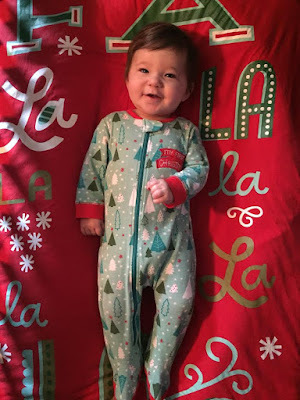 In all, I'd say Brayden's First Christmas was a great one, despite the business of everything! We really enjoyed spending time with our families and seeing brothers and sisters that live out of state! The warmth and love that flowed between everyone we shared our time with is exactly what I love about Christmas. I cannot wait until next year! Only 361 days to go! Over the years as a runner, I've participated in my fair share of races - from themed runs to those through the mud and everything in between! However, my favorite types of races have always been based around a Christmas theme. Throw a few Christmas lights and a Santa hat in there and I'm game! 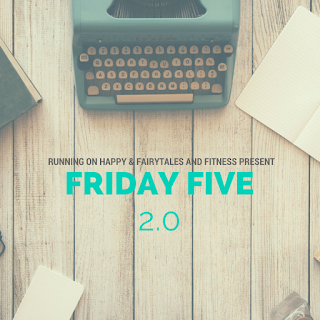 For today's Friday Five, I'm taking a walk down memory lane to share with you a few holiday races, all of which were definitely memorable for me! In 2014, my husband and I visited WDW during the Wine & Dine Half Marathon weekend and as part of our trip, we participated in Mickey's Jingle Jungle 5K. I was so excited to run this one through Animal Kingdom and it did not disappoint! We had a blast! Out of all my Christmas themed races, the Santa's Wonderland 5K is definitely the most memorable. I traveled to College Station, TX with my sister in law and some friends to participate in what sounded like an amazing 5K through a wonderland of Christmas lights. Well, the great monsoon of 2014 decided to take place that evening and the race was postponed to the following day. We were already almost there when the decision was made to delay the race and we weren't spending the night. So, we changed into our running outfits and made the most of it....we had a ball in the rain! Talk about making lemonade out of lemons! 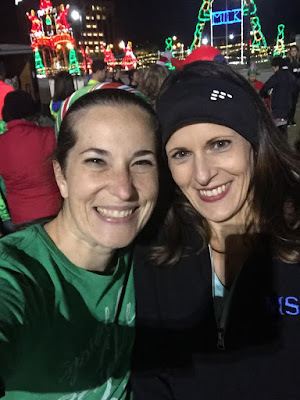 Last year, I planned to run the Santa Hustle Half Marathon in Galveston, TX with my sister in law and friends. As it turned out, I wasn't able to participate in the half marathon due to pregnancy issues, so I did the Santa Hustle 5K instead. The 5K was exactly like a shortened version of the half - complete with cookies and candy on the course! I had a great time and would definitely do this race again in the future if given the opportunity! Last but certainly not least is the Santa Hustle Half Marathon in Galveston, Texas. Despite the ridiculous weather this year, I really enjoy this race series and would love to give this one a try again. The medal is beautiful and sparkly, too! That's all for my favorite holiday races! I've sure had a lot of fun running these and look forward to more the in the future! Have a great weekend and a fabulous Christmas! 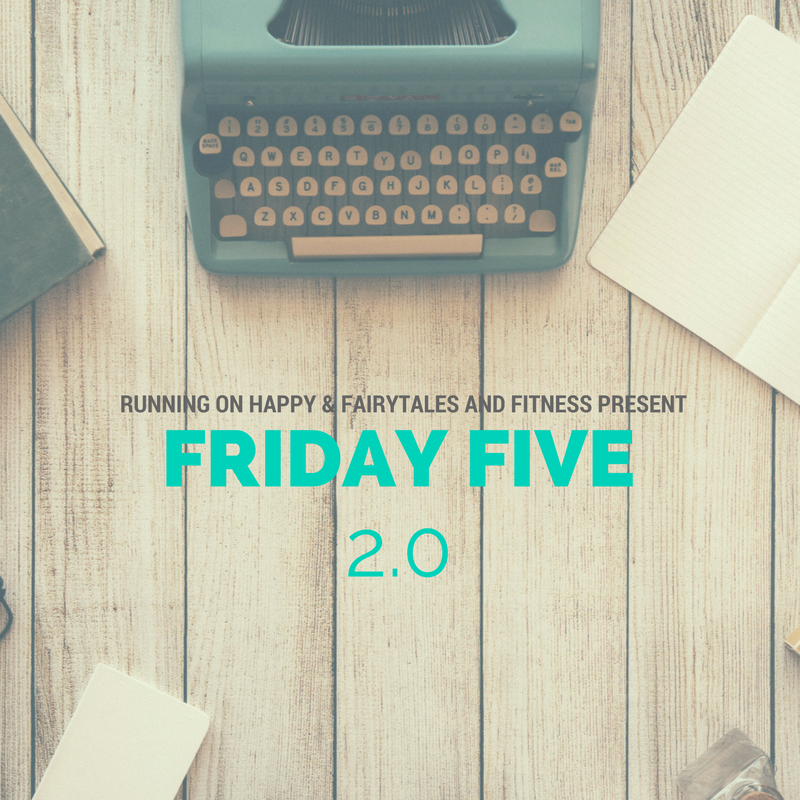 Check out Running on Happy & Fairytales and Fitness for more on the Friday Five! Every year, my running group hosts their annual Jingle Bell Run. This year, it took place on Tuesday night and was basically a little fun run throughout one of the main Christmas light areas in town (it's not a race nor is it a timed event). Runners could choose between several distances - 2, 3, or 4 miles and the course was out and back. There were plenty of jingle bells for our shoes....it wouldn't be a jingle bell run without the bells! Before we began the run, our coach started with the door prizes for both kids and adults. Guess whose name was called first?! Both mine and Heather's names were called as well! Yay! There were lots of goodies to consume, too! After getting our jingle bells on, we were ready to go! My running buddy Heather and I decided to go with 3 miles. I LOVE looking at all of the Christmas lights down this street and the jingle bell run was the perfect way to see them! We will have to keep this tradition alive, even after my running group disbands. The lights were glowing off the water...such a gorgeous route! Around mile 1.5, we turned around and headed back to the start. These trees are always festive, too! This is one of my favorite group runs and I look forward to it each year! (Here's a couple of recaps from the archives....2010 and 2012 and 2013.) Even Brayden enjoyed himself and didn't make a peep from the jogging stroller! After I returned home, I surveyed my winnings! Looks pretty good if I do say so myself! Do you participate in any holiday themed races or events during the Christmas season?